The New York City Zoning Resolution consists of 12 articles, 126 zoning maps, and three appendices bound in three volumes. The first volume is the text of the Zoning Resolution which explains the regulations that apply to each zoning district. The second volume contains the regulations for the special purpose districts. The third includes maps of the entire city, showing the zoning designation of each piece of land. A single set of maps records the zoning structure of the entire city. For easy reference, the maps have been drawn in a series of 126 sections. Heavy solid lines on the zoning maps indicate the boundaries of zoning districts. Certain districts (such as special districts or C1 or C2 districts) are mapped as overlays, modifying-but not totally supplanting-the controls of the underlying district. General provisions dealing with definitions of words and interpretations of the regulations, parking in Manhattan, sidewalk cafes, and residential conversions (Sections 11-00 to 15-50). Residence district regulations, including use, bulk, off-street parking and loading provisions, Inclusionary Housing, special urban design guidelines, and the Quality Housing program (Sections 21-00 to 28-50). 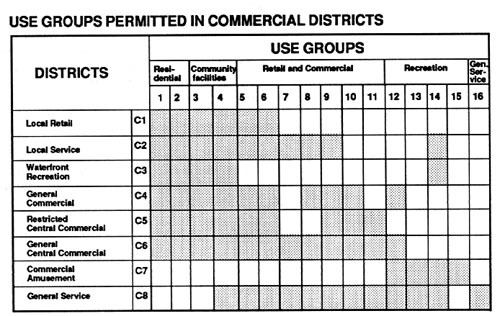 Commercial district regulations, including use, bulk, off-street parking and loading provisions, and special urban design guidelines (Sections 31-00 to 37-00). Manufacturing district regulations, including use, bulk, and off street parking and loading provisions (Sections 41-00 to 44-50). Regulations on continuance, change, or termination of non-conforming uses and non-complying buildings (Sections 51-00 to 54-40). Special height regulations around major airports (Sections 61-00 to 61-40). Administration dealing with such matters as enforcement, variances, appeals, amendments, and special permits (Sections 71-00 to 79-40). Special purpose districts (Sections 81-00 to 122-00). All words used in a specifically defined sense are italicized, and definitions of all italicized words are set forth in Article I (Section 12-10) of the resolution, or within specific sections of the resolution where those definitions apply. Most use, bulk, and parking regulations applying to residential districts are set forth in a single article (Article II). This is also the case for commercial districts and manufacturing districts (Articles III & IV). Each zoning district is designated by a letter indicating the general use classification- R for Residence, C for Commercial and M for Manufacturing-followed by a number. In residence districts, the number indicates the levels of permitted bulk and density and required parking. In R3 through R10 districts, with some exceptions, a second number or letter is used to designate a contextual district which has at least some regulations that differ from similarly labeled districts without a suffix (R6B vs R6, for example). A second number is used in R3-2 and R7 districts to indicate different use, bulk or parking requirements and in R1 districts to indicate different lot size requirements. Most commercial and all manufacturing districts have two numbers-the first number indicating permitted uses and the second number, after a hyphen, indicating permitted bulk or required parking or both. In all chapters containing use, bulk, or parking regulations, a columnar chart along the right-hand margin lists the districts to which each section applies. Where there is no columnar chart, the regulations apply to all districts covered in the Article. The chart can be used to identify all regulations applicable to a specific district quickly and easily. For convenience, a great many regulations are in tabular form, supplemented by drawings and diagrams. Supplementary tables summarizing series of regulations are also provided. 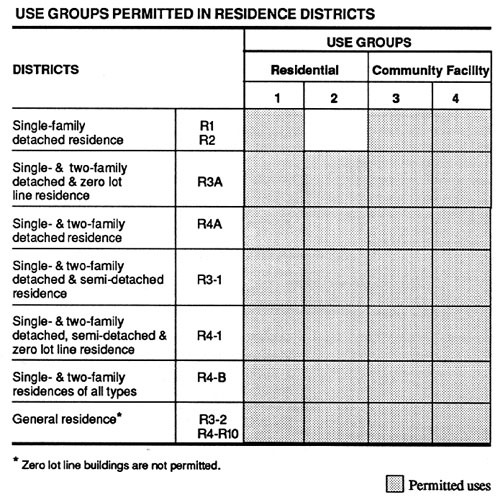 Three use group charts illustrate permitted use groups in residential, commercial and manufacturing districts. 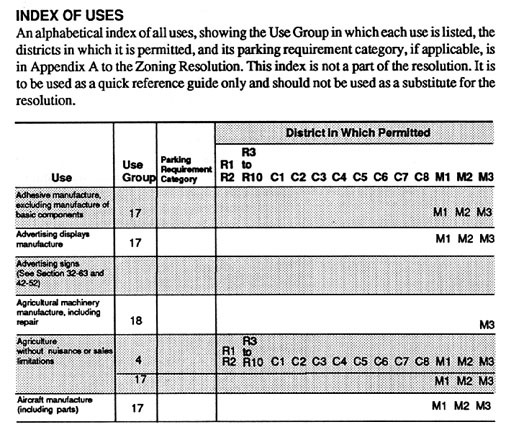 An alphabetical index of all uses, showing the Use Group in which each use is listed, the districts in which it is permitted, and its parking requirement category, if applicable, is in Appendix A to the Zoning Resolution. This index is not a part of the resolution. It is to be used as a quick reference guide only and should not be used as a substitute for the resolution.